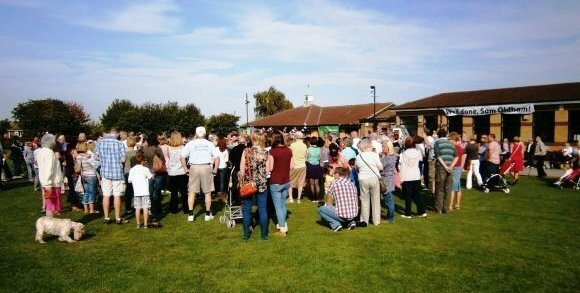 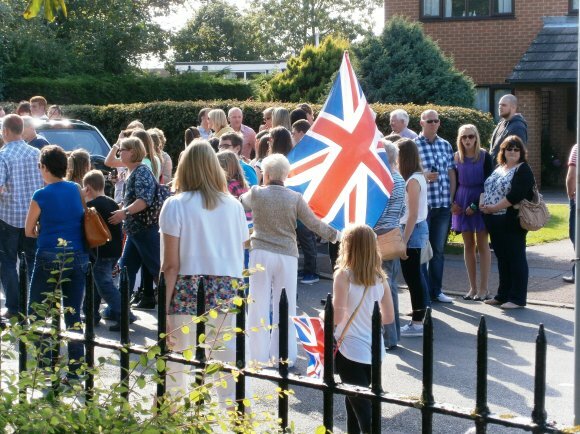 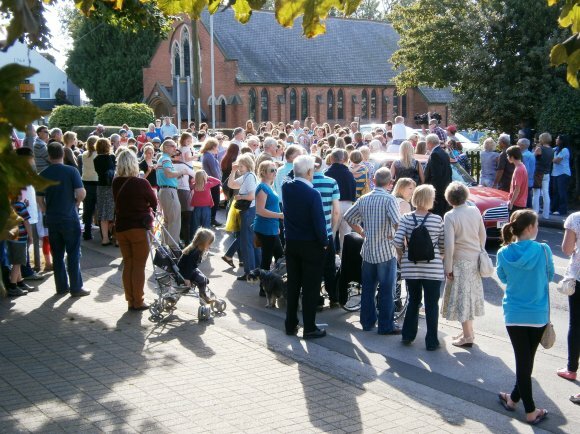 Residents came out in force on Saturday, 15th September, to pay tribute to Keyworth gymnast Sam Oldham, aged 19, the youngest member of the team which, in winning bronze at London 2012, became the first British men's gymnastics team to win an Olympic medal since 1912. 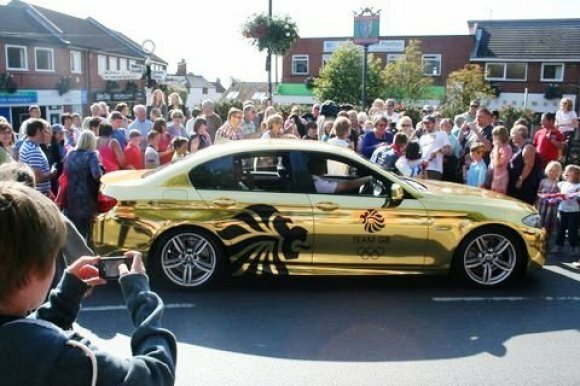 Fortunately, the sun came out as well, and it was a glorious afternoon as Sam was driven through the village in a very striking Team GB car. 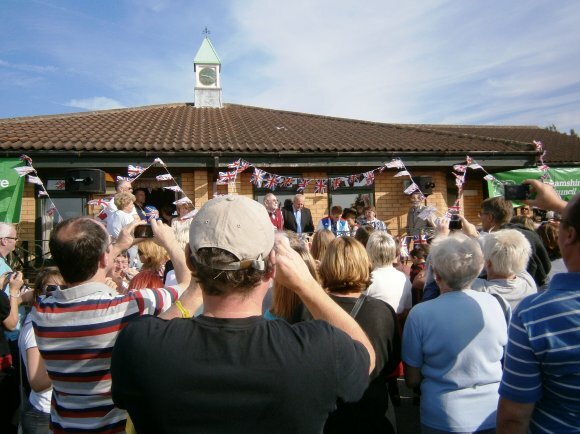 After stopping to meet some of his admirers in the square and at other points along the route, Sam arrived at the Village Hall where hundreds of people had gathered for a reception. 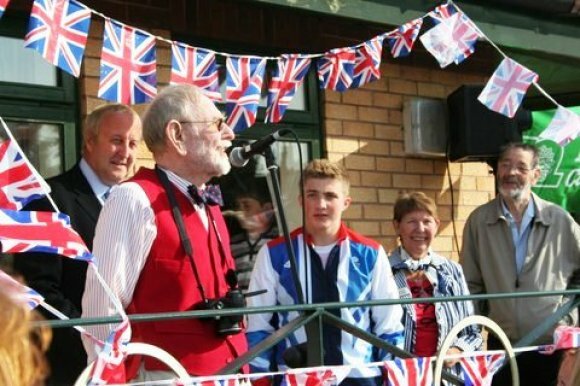 At the reception, there were tributes from Cllrs Keith Barton and John Cottee, Keith suggesting that the people of Keyworth were "standing a couple of inches taller out of sheer pride", and John handing over a cheque from his Councillors' Division Fund allocation to help finance Sam's kit for the coming year. 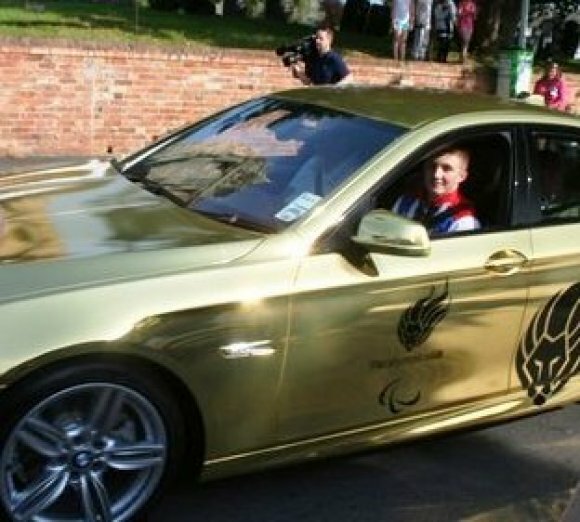 Sam, in turn, paid tribute to his "tremendous" supporters and assured everyone that he was aiming to be at Rio 2016. 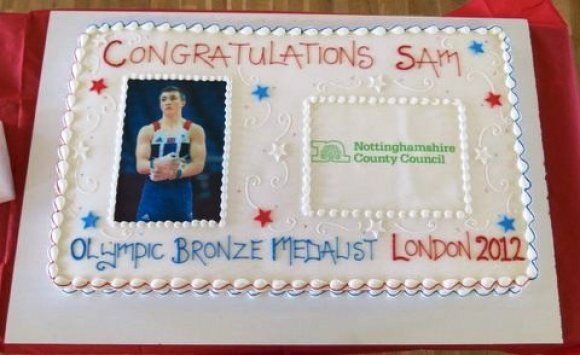 County Council leader Kay Cutts and Parish Council chairman Tony Grice were also present as Sam was invited to cut a very large cake provided by the County Council. 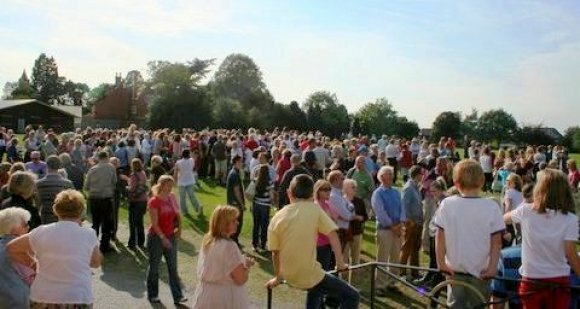 We gather that some three hundred pieces of cake were handed out, and there was still some left over for Sam and his family at a celebration later in the day. 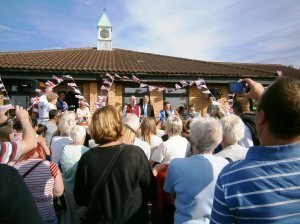 Teas, coffees and soft drinks were handed out in the Centenary Lounge, courtesy of the Parish Council and, more importantly, Sam was happy to spend the next two hours or more signing autographs, handing out photographs and showing everyone that bronze medal. 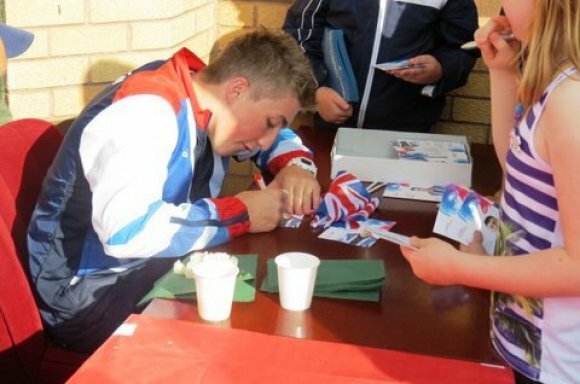 Bearing in mind that the London 2012 bid promised to "use the power of the Games to inspire young people to choose sport", it was especially pleasing to see Sam making time for his younger fans...who's to say that, among them, there might not have been at least one Olympic medallist of the future? 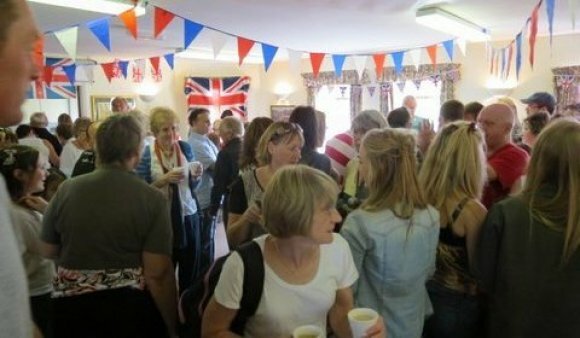 Thank you to all who attended the event and everyone who helped with the organisation and refreshments. 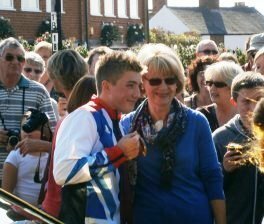 Thank you also to Sam, the star of the show, for coming along and accepting the plaudits with such modesty and good grace. 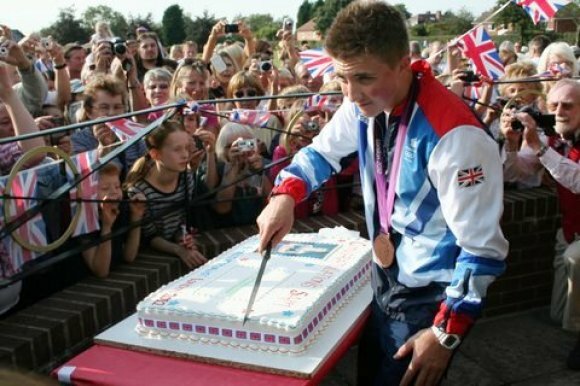 We wish him well in his future endeavours.